Update edit all you need to read is how to jump the fog lights. It shouldn't take more than 30 minutes even if you're slow and all you need is some 16-18 gauge wire (note be careful and I am not responsible for anything that goes wrong). 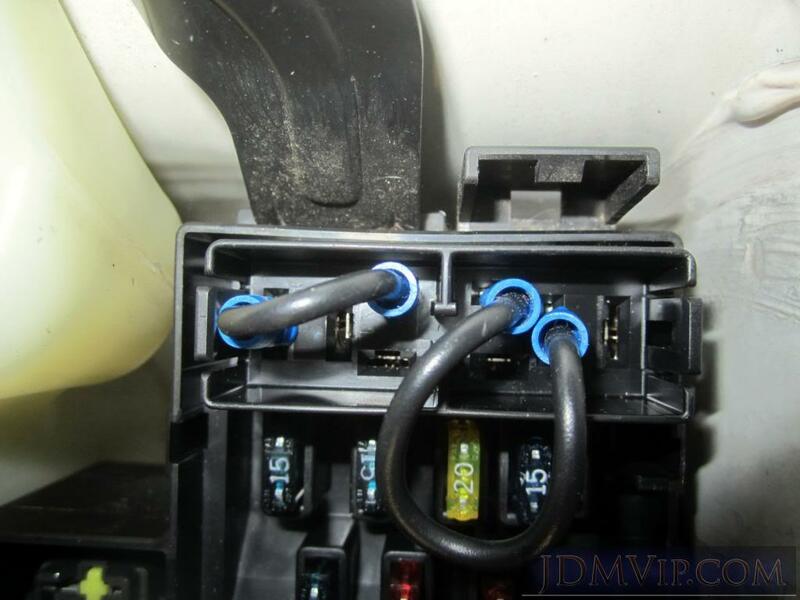 You have to be very careful not to touch the center prong in the fog light relay (or any relay) whatever one is a constant 12V never touch it (always confirm the active wires using a multimeter first and be very careful you don't insert the wire into the wrong prong). The old VanMikel method does not work and is not possible on these models. Now I think we could maybe power the lights from the 12V battery if we could have some sort of relay that would be triggered the engine starting (someone link to a simple kit like that if they know it). Also I believe this method should work for any similar era Subaru especially if your fusebox is the same, if not it is the same idea as what I've done. Is it the same as hacking the headlight relays like the BH5 / BE5 models? Last edited by jdmvip; 01-08-2019 at 04:46 PM. Fusebox is different and I believe on the top left of the pic are the two headlight relays. Maybe the pinout is the same as the previous series? OK guys so here is the headlight relays off it does look similar to the previous models like BH5 and SF5 Subaru's but the fusebox layout is definitely different. I am going to use a voltmeter to try and reproduce what our old friend VanMikel did because there's no way to be sure how things are wired. Hopefully I have it right but I am dividing the delays into "two prong sets" based on VanMikel's explanation it should be simple. When I say sets notice how there are always 2 prongs side by side or facing each other and they are in sets (eg. the next set is rotated 90 degrees). One prong in a set will have constant 12V even without ignition. Connect the other end of the wire to the prong with the 12V ignition. One other note from VanMikel's experience is that each relay was actually totally different and not similar (even he was surprised by this). So we will need to do this test for both headlight relays as they will likely not be similar (or at least it's crazy if we assume they are since we have seen in the past models they weren't!). *Actually I just uploaded a pic of what I mean by prong sets. Last edited by jdmvip; 12-30-2018 at 02:12 PM. Really keen to see how you make out, there will be a lot of these legacies coming to Canada in the next few years and this is a much better solution than the aftermarket DRL modules. It is different than previous models of Subaru (at least compared to the BE5/BH5 Legacy and SF5 Forester) but the same idea applies. I found the constant 12V and then assume (hopefully correctly) that its neighbor is the 0V on the headlight coil and then found 12V with ignition on. The second diagram shows how the wiring should work assuming my work is right. Could someone check my work too just in case? I don't have pics of it wired up because I have to grab some higher gauge wiring that I used to have on my BH5. The top most relay in the pic is the "left headlight" and the bottom most relay is the "right headlight". Last edited by jdmvip; 01-01-2019 at 02:57 PM. One other word of caution is that I broke the plastic cover on one of the relays after removing them for the third time with pliers (you may get lucky the first or secon timed but there's pretty much no way they are coming out easily without much grip from the pliers).. I could never get them off with my fingers so I was using the pliers. Another weird thing is that when taking off the relay closest to the chassis (the top most relay in my pic above) I hear some kind of beeping sound from inside the cabin (sometimes the headlight will also trigger on and off). There are grooves that allow you to get deep to the relay but I am assuming you would need two flathead screw drivers or some specialized tool? Is there some sort of "relay removal tool" just like we have one for normal fuses? Last edited by jdmvip; 01-01-2019 at 02:51 PM. The red probe is pointing at 12V ignition on and the screwdriver blade is pointing at constant 12V. Hey guys so I shoved some wire between the pins that I mentioned in the diagram above and there is nothing (lights do not turn on with ignition on). I swear I can hear a low pitched whine when the ignition is on coming from the fusebox area (almost like an alarm type of buzz or whine or door open whine). I haven't checked 100% if the 0V end is getting the 12V but I kind of suspect there is some other mechanism or something else that detects if the other pins in the relay are shorted (or in other words if it is really plugged in). How have the rest of you rigged up DRL on your newer model Subaru's? Also does anyone have any diagram of all of the relays? Could it be I have the wrong relay somehow? (although when I remove these relays I cannot turn on the headlights anymore) but some confirmation would be nice. I have found fusebox diagrams but none of them seem to describe what each relay is. Here's the RHD relay page from the factory service manual. Hope it's helpful!